Of the many national parks in Costa Rica, Manuel Antonio is actually the smallest, but one of the most land and marine biodiverse parks in the country. Manuel Antonio National Park is located on the Central Pacific Coast, just 5 miles (8 km) south of the town of Quepos in Puntarenas, and about 82 miles (132 km) from San Jose. Established in 1972, Manuel Antonio is one of the most visited national parks in Costa Rica due to its incredible wildlife viewing and pristine white sand beaches. Here, the rainforest meets the ocean–something one must see in person to truly appreciate. In 2011, Forbes named it one of the 12 most beautiful national parks in the world. Although it is the smallest of the national parks (covering 4,482 acres), it protects a large number of natural habitats, including marshes, mangroves, and primary and secondary rainforest. It features three main hiking trails that wind throughout the park, and three picturesque beaches (Manuel Antonio, Espadilla Sur, and Playitas). 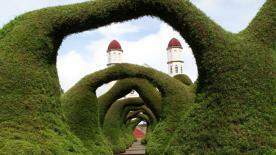 It is home to 109 species of mammals and 184 species of birds and is one of the most biodiverse regions in Costa Rica. 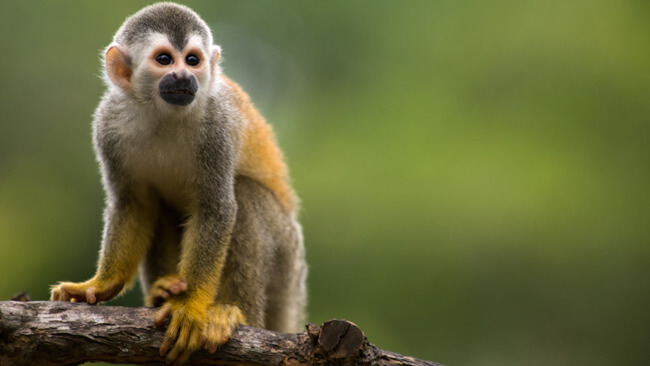 Here it is common to see four different monkey species: White-Faced Capuchin, Howler, Spider, and endangered Squirrel Monkey. It is also home to both two-toed and three-toed sloths, as well as numerous reptiles, amphibians, coatis, bats, agoutis, armadillos, raccoons, and snakes. Among the bird species common to the park are toucans, woodpeckers, motmots, tanagers, and hawks, just to name a few. Punta Catedral (formerly an island with rainforest-topped cliffs) is located within the park and separates the park’s two most popular beaches, Espadilla and Manuel Antonio. It is accessed from the mainland by a thin land bridge and takes about an hour to get to the top (about 328 feet or 100 meters). From here, visitors can enjoy wonderful views of the coastline, park, and surrounding area. To tour the park, a professional guide is highly recommended. They are masters at spotting anything and everything lurking on ground and in the trees, and they use high-powered telescopes to get the best view. The actual hike through the park is done mostly on dirt hiking trails and takes approximately three hours to make the circuit. It is recommended that visitors tour the park early in the morning for the best wildlife viewing when the animals are most active; it’s also important to arrive early in high season as there can be very long lines to enter the park. Visitors will wants to take a bathing suit and towel to enjoy the wonderful beaches within the park after doing the tour. The park is open Tuesday-Sunday from 7:30 a.m. to 4:00 p.m. General admission is $10. A guide is usually about $25 per person which includes your entrance fee. Guides can be found at the main entrance of the park–just make sure they are affiliated with the ICT (Costa Rica Tourism Board). Once you pay your entrance fee, you can enter and exit the park as often as you like throughout the day. Just outside the park, there are numerous local and international restaurants and places to get a cold drink. To get to the park, it’s a quick cab or bus ride from all of the hotels in the area. 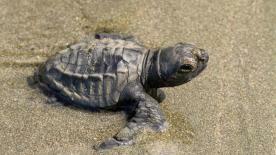 Peak months for Manuel Antonio National Park are December to April during dry season. The transitional months between Summer and “Green Season” are also good times to visit (May, June, July, and later November). September and October are not ideal months to visit the Central Pacific due to heavier rainfall during this time; however, one will enjoy smaller crowds in the low season months. Public transportation: Yes; frequent buses run San José-Manuel Antonio, and also between Quepos and Manuel Antonio. Taxis are prevalent. Public amenities: Yes; there are public bathrooms, showers, and water fountains within Manuel Antonio National Park. Shopping: Just outside of the park entrance, the shopping is abundant, from larger grocery stores to roadside fruit stands. Open-air souvenir shops abound. ATMs: Yes, and there is also a Western Union in Quepos. Gas stations: No; there is a full-service gas station in downtown Quepos, a ten-minute drive away. WiFi or Internet cafés: Many mid-range and upscale hotels and restaurants in front of the park entrance offer free WiFi; Internet cafés are also popular in downtown Quepos. Cell Phone Reception: Some reception. Restaurants: Yes; there are many options in front of the park entrance, suiting all budgets. Nearest medical facilities: There is a Red Cross in Quepos, as well as many English-speaking doctors. There is a public hospital located on the outskirts of Quepos.